Home Hospice Navigation provides an organized and comprehensive roadmap to better understand the key areas needed for a quality home hospice experience … The book is intentional in its design, organizing the diverse and robust content in a logical order … There is crucial content on the misconceptions of hospice, which is a must for caregivers to know. In Home Hospice Navigation, Ms. Sands assumes the reader is not familiar with the intricacies of the healthcare system related to Hospice. She provides a detailed, yet accessible, description of what the caregiver needs to know to engage supportive care through hospice and to interact with and manage the activities of life as it winds down. Clearly written, well organized, and comprehensive, this book should be read by anyone who has a loved one with a life threatening illness or by anyone who wishes to open the end of life discussion with their family. This book is a comprehensive roadmap of the many considerations a caregiver must address when a loved one is in decline. It provides clear and straight-forward information as well as helpful links to resources available to assist with many aspects of end-of-life care. I wish I had read it when my parents were in their final years. I highly recommend this book in every respect. 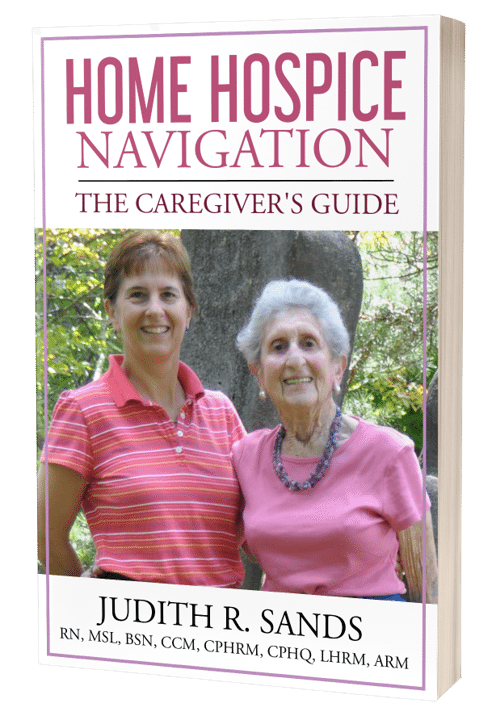 As a healthcare provider and daughter that is going through the caregiving maze, I found Judith's writing on this timely topic of hospice care to be clear, concise and informative, sprinkled with her special warmth and personal anecdotes. Lisa Feierstein, RN, BSN, MBA President, Active Healthcare, Inc. In Home Hospice Navigation, Sands provides a how-to style guidebook to navigating the world of caregiving. Sands’s own experiences in caregiving provides stories and reliable information for those seeking guidance and reassurance in a comprehensible and concise manner. The book opens up about real conversations and questions that caregivers have at the end of a loved one’s life.